There is an old saying, when you want to be a great Treasure Hunter, all you need is more energy. By building yourself another Small Garden, you will be able to grow more fruit! 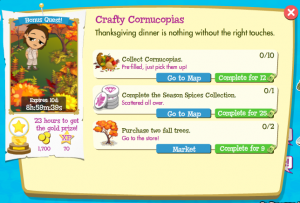 And this is just the Quest for you to get that extra Small Garden in your home island! 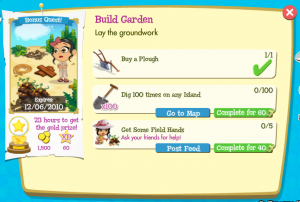 There are 3 Tasks to this Quest and it is basically the laying of the foundation and getting ready the land for the extra Small Garden. Isn’t this simple? Do you think this is all you have to do to get a Small Garden? Guess again … As it says, this is just the beginning. Ladies and gentlemen, start your engine! 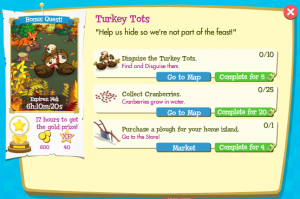 Another late post from me on the Thanksgiving in Treasure Isle and this is called the Turkey Tots. Thanksgiving is all about the Turkey or was it so? 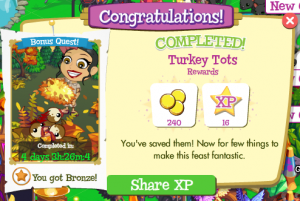 The main idea of this Quest is to hide the Turkey Tots with the autumn leaves and remove it from visibility, just so that they do not end up on the dining table. My reward for completing this in Bronze timing is 240 Coins + 16 XP . 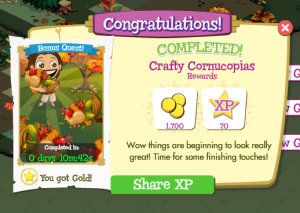 My reward for completing this Quest in Gold timing, 1,700 Coins + 70 XP !